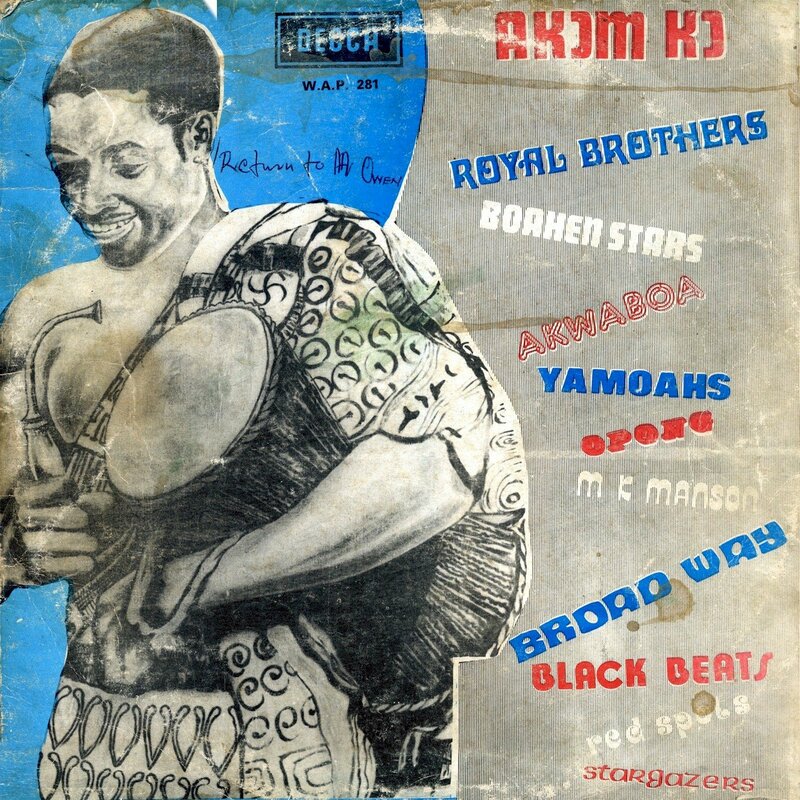 Reader/listener Malam Bala, in a recent comment, reminded me that this blog is long overdue for a posting of good old Ghana highlife music. And what better way to correct this oversight than to post the LP Akom Ko (Decca WAP 281)? This fine compilation features the down-home sounds of guitar highlife on Side One, while Side Two showcases the more sophisticated danceband sound. Back in the 1990s John Storm Roberts' Original Music label released a series of Ghana highlife CDs that are eagerly sought out by African music aficionados, being as they are long out of print. Giants of Danceband Highlife (OMCD 011, 1990), I've Found My Love: 1960's Guitar Band Highlife of Ghana (OMCD 019, 1993) and Telephone Lobi: More Giants of Danceband Highlife (OMCD 033, 1995) cover much of the same musical territory as Akom Ko, but there is very little duplication of the music itself. So, if you are fortunate enough to own any of the Original Music compilations, consider this another volume in the series. 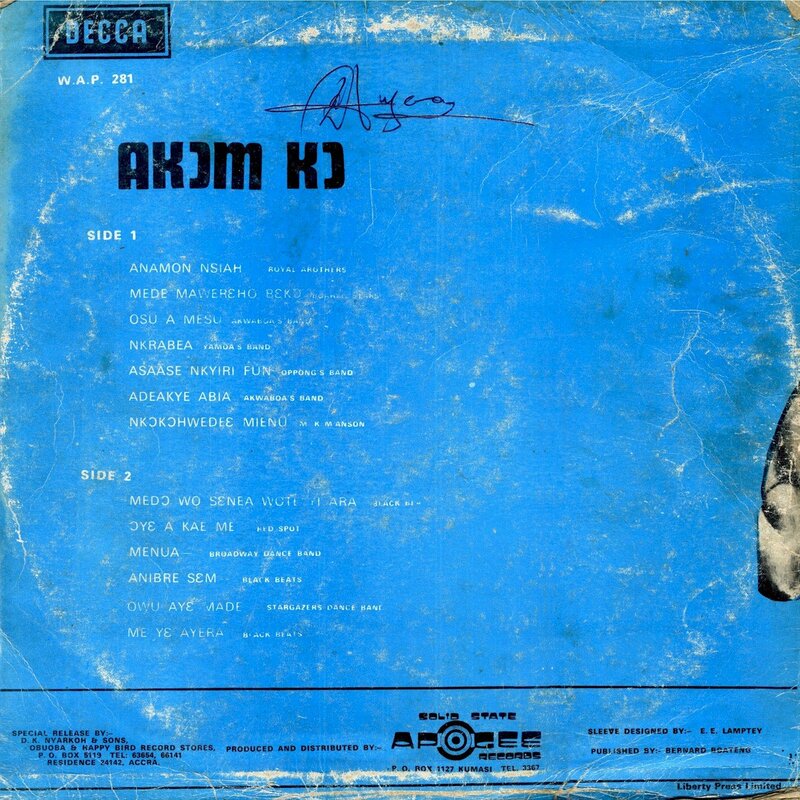 I suspect these recordings were made in the 1960s or at the very latest, the early 1970s, but Akom Ko itself was apparently pressed sometime in the '70s. I've tried to find out as much about the musicians as I could, but some artists, as talented as they are, dwell in obscurity. I'm passing on what information I have. If you'd like to pursue further studies, John Collins' "Musicmakers of West Africa" (3 Continents Press, 1985) is a good place to start, as well as a number of very informative articles he's written for Afropop Worldwide. Update: Akwaboah, who hosts the excellent new blog Highlife Haven, writes: ". . . please let me correct your remark about Kwabena Yamoah: he is the bandleader and guitarist, not the singer. The 'treble singer' on Yamoahs albums is the great Agyaku, who later recorded with Eric Agyeman and Smart Nkansah's Sunsum Band." Thanks, Akwaboah!